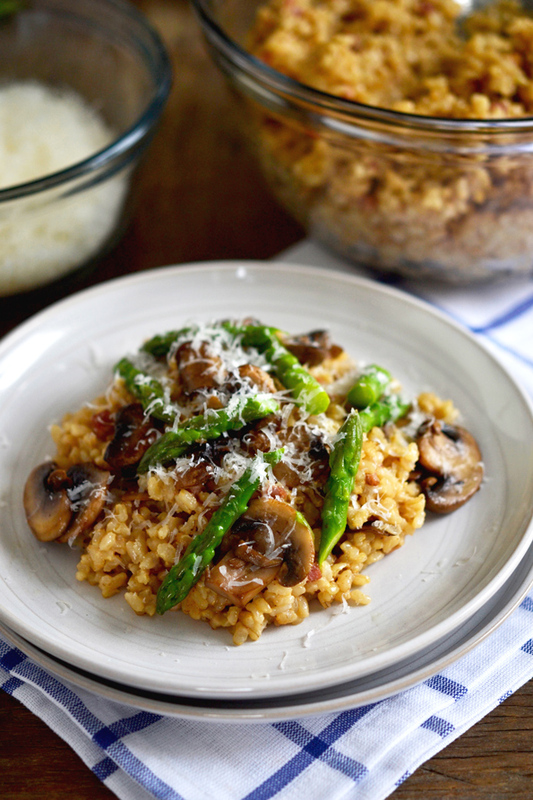 Gluten Free Brown Rice Risotto Recipe | Great gluten free recipes for every occasion. I think there was an episode of The Next Food Network Star (is that still on?) years back where one of the would-be stars made risotto for some food luminary (Wolfgang Puck?). He positively skewered her attempt. Took her by the hand, led her back into the kitchen and gave her a lesson. I’m pretty sure what she remembers is not how to make risotto, but instead how she was made a fool. If you ask me, I’d say they both embarrassed themselves, he more than she. Then again, it was reality TV and you gotta take your lumps or they don’t get the ratings. And I guess she should have known that, but still. Short grain brown rice (I buy Lundberg Family Farms brand, since it’s reliably gluten free and good quality) is pretty much a constant in my house. 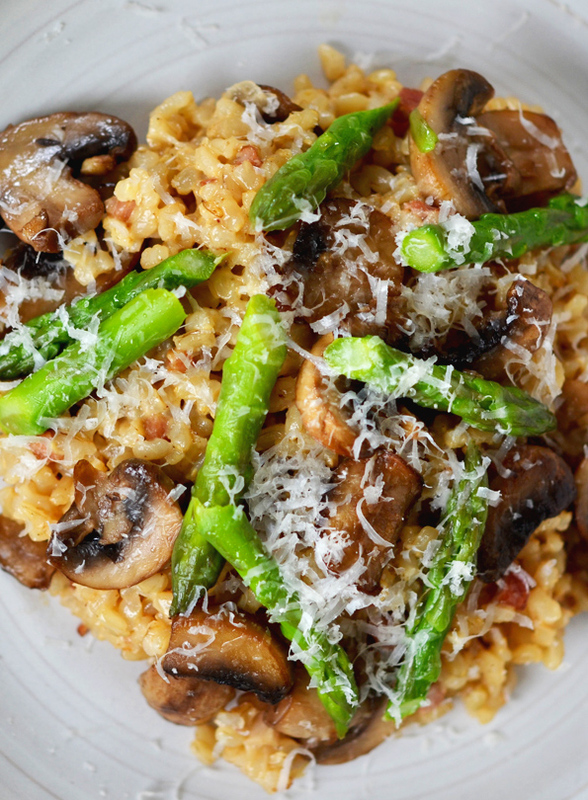 It’s much, much less starchy by nature than white arborio rice (not that I’m bragging about that – who doesn’t love the taste of the starch in arborio rice? ), but if you cook it the right way it’s creamy and delicious. It does take a few minutes longer to cook than its white cousin, but it pretty obviously beats the pants off the white stuff in nutritional value and I have come to love its bite. Now 2 of my 3 children are wild about mushrooms and even enjoy some lovely asparagus spears now and again. They get the whole shebang. The third of those children? Try as she might, vegetables are still a struggle for her, even at 11 years old. She has really tried. We recently discovered that she really enjoys raw baby spinach (especially if it’s drizzled with this roasted shallot vinaigrette), so there’s that. Anyway, that third child will eat some of the asparagus since she understands that vegetables keep you from gorging at every meal and will somehow improve her softball game (hey, don’t judge), but she can skip the mushrooms. So after I cook the mushrooms (see the directions below), I just remove them from the saucepan and set them aside. Then I quickly cook the asparagus and when I build this particular child’s bowl, I just … skip the mushrooms. No biggie. Nobody wants me to skip the grated cheese. I mean, c’mon. The real secret to cooking brown rice risotto in particular is more stock (more liquid) and longer cooking time. Okay, that’s two secrets, but they’re not really secrets, as those go. They’re more like tips. But you kind of can’t beat this easy stovetop dinner. And since it starts with a base of pancetta, it’s smoky and salty and then still creamy and deep. Dinner is served! In a large, heavy-bottom saucepan, place the pancetta and cook over medium heat, stirring frequently, until the fat is rendered (about 2 minutes). Add the shallots and cook, stirring frequently, until translucent (about 4 minutes more). Add the rice and cook, stirring frequently, until it has become somewhat translucent (about 2 minutes). Add the wine and continue to cook until the alcohol evaporates (2 minutes more). Add 3 cups of the stock, stir, lower the heat to medium, and continue to cook, stirring occasionally, until the liquid is mostly absorbed (about 20 minutes). Add at least another cup of stock and cook stirring frequently until the liquid is mostly absorbed. Continue to add stock until the rice is al dente (you’ll have to taste-test to determine) and the risotto is creamy. Salt and pepper to taste. While the rice is cooking, place the butter and olive oil in a separate medium saucepan and cook over medium heat until the butter is melted. Add the mushrooms and cook, stirring occasionally, until the mushrooms are softened (about 5 minutes). Add the asparagus and about a dash of kosher salt, cover and cook for about 1 1/2 minutes or until the asparagus is bright green and slightly softened. Remove from the heat immediately or you will overcook the asparagus. 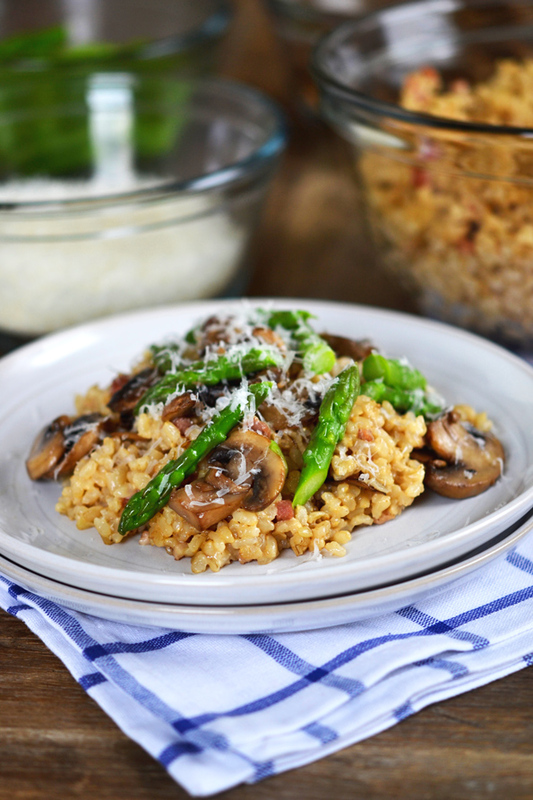 Serve the cooked rice in bowls, top with asparagus and mushrooms and sprinkle with grated cheese. Adapted from the Tomato and Corn Risotto on page 113 of Gluten-Free on a Shoestring Quick & Easy: 100 Recipes for the Food You Love—Fast! (Da Capo 2012). P.S. If you haven’t yet, please pick up your copy of the Gluten-Free on a Shoestring cookbooks! Otherwise, I get all insecure and stuff. This looks divine! Company-worthy! And I think I can get one of two kids to eat this topped with vegan Parmesan for our GFDF family. As always, thanks for the recipes. Can’t wait for cookbook number 3! I consider this a bit of a make-your-own dish, Candice, since very little is a must-have (including the cheese), so hopefully you can make it work! Thanks so much for your support. I can’t wait for Book 3 either! oooo-ee! I remember that episode – because after Wolfgang took her away, Bobby Flay said JC under his breath but the camera caught it and all of America saw it! I could not stop laughing for days! FYI: A new season one just started this past Sunday. 8pm CT on Food Network! Thanks for this ultra yummy dish – one more to add to my repertoire of GF goodness! You’re the best! No way, Jennifer!! So apparently everyone in America saw it—except for me! I don’t remember that at all! It just seemed pretty unnecessarily nasty of go old Wolfgang, but I’m sure the network just ate it up. I haven’t watched the show at all since that season, but I know I’d get sucked right back in if I started. Making this! I really appreciate your main dish recipes. I don’t crave the baked goods much anymore but creative main dishes, yum. I still have and will have all your books. Really looking forward to the next one, breads I think. We love rice but eat much less of it since there is arsenic found in all of it now. There is arsenic in a lot more than just rice, CommonTater. Processed rice products (like brown rice syrup) have much higher concentrations of arsenic than plain rice (particularly brown rice, which is less processed), but if it is of great concern to you then this clearly isn’t the right recipe for you. My family is getting very spoiled by your recipes! I’m glad when they enjoy something, but at the same time, wonder how I’m going to keep up the pace of cooking for them! :) I made your Wheat Thins yesterday, and everybody loved them. I may have to make a double or triple batch every week! 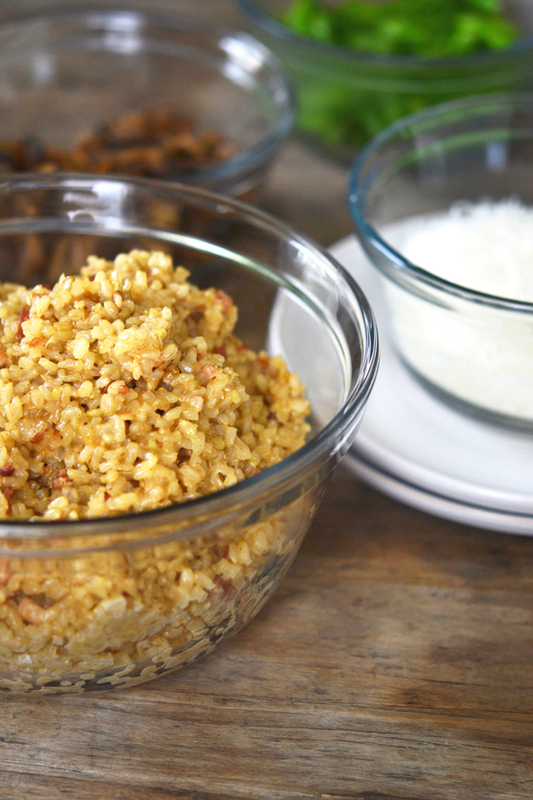 I prefer brown rice over white, and this looks like a great recipe. Maybe I’ll make it for them…… My 12-year-old can babysit it! That’s a good problem to have, all things considered, Donia! ;) But I hear you overall. I don’t enjoy food pressure. I know, it IS a good problem to have. Especially since a year ago, we were relying on inedible store-bought bread and packaged products to feed her. Nearly all of your recipes have been total winners and loved by my family, so thank you. P.S. I just remembered that they now make Wheat Thins with cinnamon sugar on top. Next batch, I’m totally going to do that!